I won't lie, as a product junkie and avid proponent of supporting small businesses, I couldn't wait to get my hands on Inahsi Naturals products. Founded and ran by husband and wife team Brian and Rhonda Marshall, Inahsi Naturals is quickly emerging as a serious contender in the natural hair care world. Rhonda is a cosmetic chemist (and science teacher!) by trade, with the degrees to back it up. She has been whipping up natural hair goodies for herself, her daughter, family, and friends for years, which inspired the creation of Inahsi Naturals. Simply put, Rhonda knows her stuff! All of the formulations for Inahsi Naturals are her own creation, and her husband Brian is instrumental in running the business end of the brand. 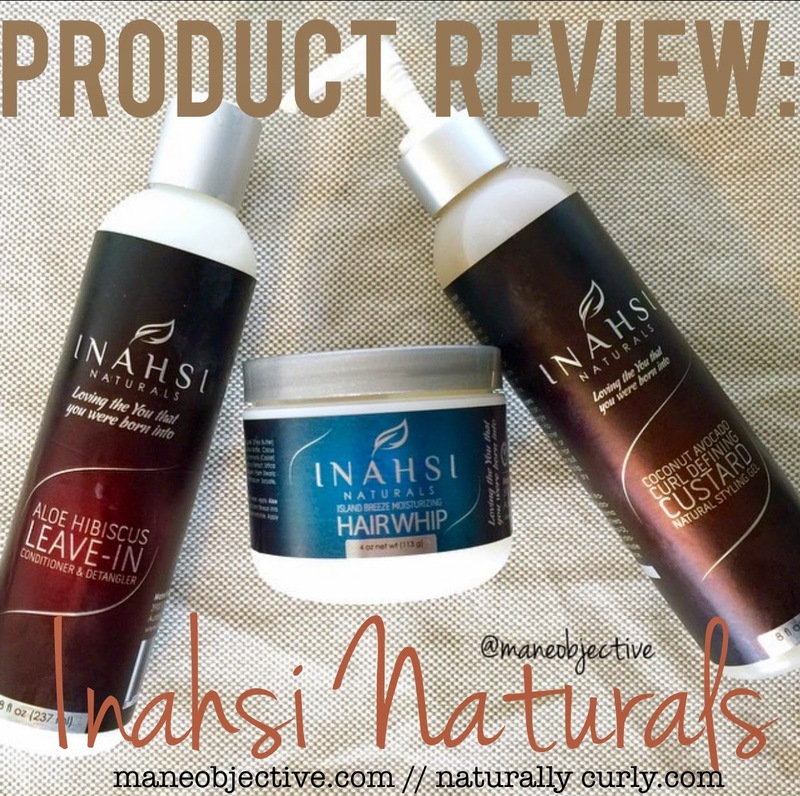 The Inahsi Naturals hair collection consists of three products -- the Aloe Hibiscus Leave-In Conditioner, Coconut Avocado Curl Defining Custard, and Moisturizing Hair Whip. The fragrance of all three is "Island Breeze", and let me just tell you that it smells good enough to eat! The light, sweet, tropical, and slightly fruity aroma makes using these products an even more pleasurable experience. Since I'm talking about experience here, how about I just dive on in to this review? Castor Seed Oil: Thick, highly viscous oil with antibacterial, antifungal, and humectant properties. It is also a great moisture sealant, and promotes hair thickening and growth. Hyaluronic Acid: A gel-like molecule naturally produced within the human body that hydrates the skin and hair, keeping them supple, elastic, plump, and youthful. Hyaluronic Acid applied topically to the hair, scalp, and skin boosts hydration and fights the signs of aging and damage. Panthenol: Vitamin B5, known for quick absorption into hair and providing moisture control. Distilled Water, Aloe Vera Juice, Coconut Oil, Avocado Oil, Castor Seed Oil, Hyaluronic Acid, Panthenol-DL (Pro Vitamin B5), Cetyl alcohol, Cetearyl Alcohol, Behentrimonium Methosulfate, Hibiscus Extract, Nettle Extract, Horsetail Extract, Marshmallow Root Extract, Silver Dihydrogen Citrate, Potassium Sorbate, Natural Fragrances. Of all the Inahsi Naturals products, I'm pretty sure that the Aloe Hibiscus Leave-In is my favorite, for a number of reasons. Beyond the fragrance that I'm totally infatuated with, I absolutely love everything about the leave-in -- from the consistency and feel, to the performance and how well it plays with other products. The leave-in is very creamy and smooth, but does not feel greasy, or waxy whatsoever. It's the perfect hydrating foundation for whatever style you're going for. It's performs exceptionally well as a leave-in, and had enough slip to work effortlessly through my curls. The leave-in is pretty much foolproof -- you can use a little or a lot and still get great results without your hair feeling parched or weighed down with product. I also appreciate how well the leave-in played with the Inahsi Naturals Coconut Avocado Curl Defining Custard, and other curl definers by other brands. A leave-in that works well across a number of products is a must for me! Curious about Inahsi Naturals? Click here to read about the Moisturizing Hair Whip and Coconut Avocado Curl Enhancing Custard on NaturallyCurly.com! Your posts are really engaging in reading.